BCI Smart Rewearable Wristband - Child 6 inch - Day Glow Green - 250 wristband case. Available Customizations with additional mold fee include silk screening, debossing, and embossing. Flexible, waterproof 100% silicone material with embedded UHF transponder makes it comfortable and durable for long lasting use. Superior read distance and ideal for timing events, passive tracking and festivals. 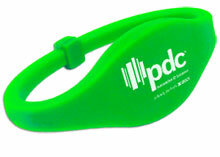 Available in 20 attractive colors and 3 sizes, the wristband is ideal for a variety of applications. Wristbands can be molded or screen printed with your custom logo or promotional message! The BCI RWUC-39-PDJ-I is also known as RWUC-39-PDJ-I	or RWUC39PDJI	.